I was not that surprised this morning when the Today Show announced a big misconception. 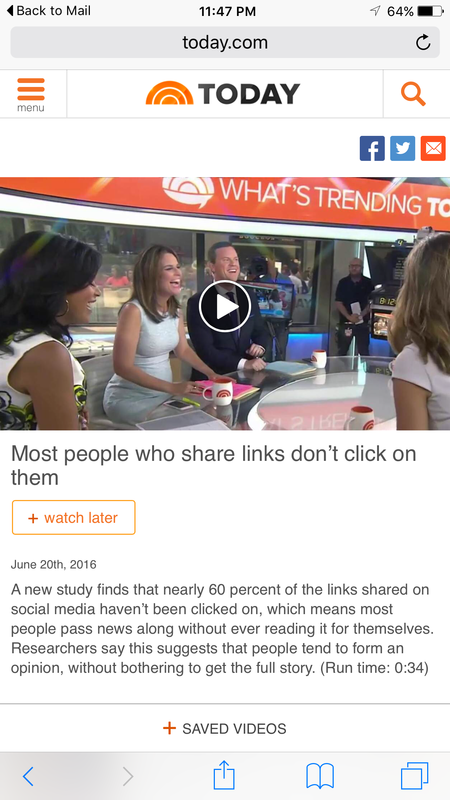 A new study finds that nearly 60 percent of the links people share on emails and social media have never been read by the sender. If you click here, you can watch the Today Show announcements. That explains the ridiculous and insane political emails I receive from people who I thought were my friends. The study suggests they read the headlines of a story and have no patience to read the rest. This entry was posted in digital, senior lifestyle, tech and tagged The Today Show by loiswhitman. Bookmark the permalink. I don’t know about everyone else who doesn’t click on links, but who has time to read everything they are sent, let alone what they chose to read and/or are more interested in protecting their computer from malware, viruses, etc..
Amazing how they know the percentage – as if we have little spies in our computers! If you want to know my opinion of the Today show, then that’s another story. We are so busy these days! I confess, I don’t read the complete article every single time. So many writers are devoted to writing long, unnecessarily winded articles—no wonder they are not completely read. As someone who reads online for many hours each day, I am sometimes dismayed at how long many articles are, and when you delve into them, you can tell that they could have been much more succinct. So there’s my piece for his morning!